Today I am very pleased to present a guest post by travel blogger and fellow Washingtonian, Christina Saull. Her full bio follows the piece, but be sure to check out her site My View from the Middle Seat for the best in D.I.N.K. travel. Every year when I visit New York City, I always make a point to visit Ground Zero. To see the site transform. To pay my respects to those lost. To reflect on life. For too many years, the site looked like a construction zone: nothing but a big hole of dirt being moved around. When construction on the Freedom Tower finally began, it, arguably, looked even more like a construction site. But then, between my visits in July 2010 and October 2011, sometime miraculous happened: a beautiful memorial park appeared. It is a fitting tribute to those who were lost on September 11, 2001 at the World Trade Center, in the Pentagon, in Pennsylvania, and those who were lost in the attack on the World Trade Center in 1993. One day, visitors will simply be able to walk up to the massive memorial pools and into the museum right off the street. But in the meantime, until construction is completed, some advanced planning is required. 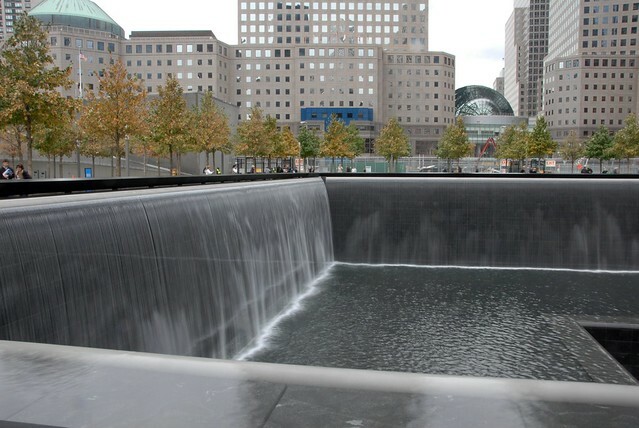 To gain admission, visitors must reserve complimentary timed entrance tickets on the official 9/11 Memorial web site. Tickets should be reserved as soon as your hotel room is reserved – popular times (weekends and holidays) fill up months in advance. The memorial is open year round at various times, depending on the season (seasonal dates can be found here). Victims’ family members who wish to visit the memorial have their own web site and reservations process (as do large, organized groups). – Don’t bother arriving more than 30 minutes in advance because there won’t be a line for you to get in. – You will be waiting outside in the rain/snow/hot/cold/wind. Until the museum opens in September 2012, there are no indoor or covered portions of the memorial site, and even after it opens, visitors will still have to stand outdoors to gain admission. – Everyone stands in the same line – regardless of ability – and it’s a lot of standing for older or younger folks. Keep this in mind when you book your reservation time. At the appointed time on your ticket, your line will be admitted into the building to go through security. Security was similar to what you would find entering a federal building or other secure area – but not nearly as invasive as the airport. Bags will be scanned by an x-ray machine and visitors will walk through a metal detector – the zippers on boots set it off, but I was quickly cleared through by a very pleasant security officer. After a short walk, in which you show your ticket several times, you finally arrive at the memorial. Both my husband and I found the site emotionally overwhelming when we first walked in & approached the south memorial pool. The only sound you hear is the largest manmade waterfall in North America – the millions of gallons of water spilling over and into the voids where the towers once stood. The sense of loss is profound as the water runs toward the middle of the pool, where it disappears into a midnight black void. 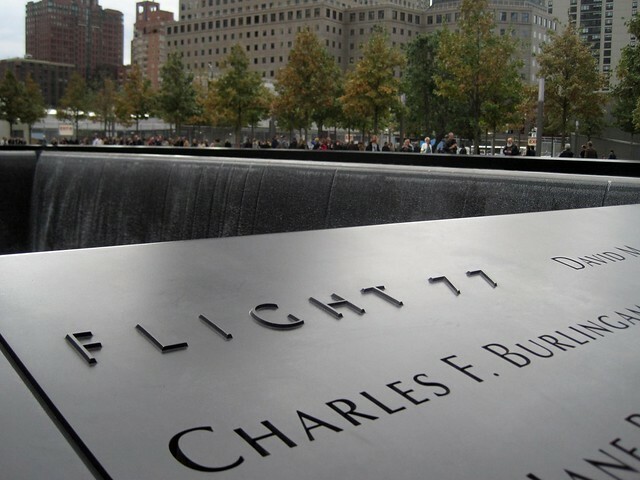 It’s virtually impossible to imagine the towers being there – the footprints seem too small. Take time to walk completely around both the north and south memorial pools. 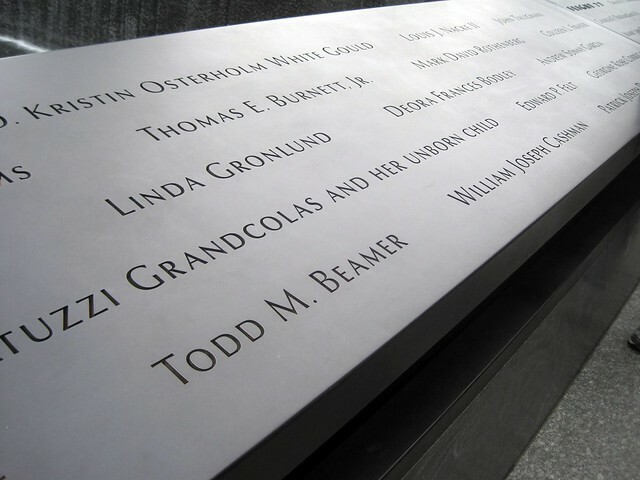 Run your fingers over the thousands of names punched through the bronze parapets – names arranged by relationship, so that co-workers, friends, & family members can be remembered together. Stop to talk with the workers at the site – the construction workers whose noisy jobs blend into the background as you’re standing at the pools; the workers who patrol the memorial, answering questions and helping find names of loved ones; the Port Authority Police Officers who patrol the sacred ground – they all have the same spirit and sense of the importance of their job. Stop, say a prayer, reflect, remember. While tickets have a timed entrance, visitors are welcome to stay as long as they would like. Slowly walking around both the pools (and walking around one of them twice because we were looking for a name), took us about two hours. Once the museum is open, I’m sure that timeframe could easily double. Before or after you visit the memorial, take a moment to visit the Visitor Center, located one block south. 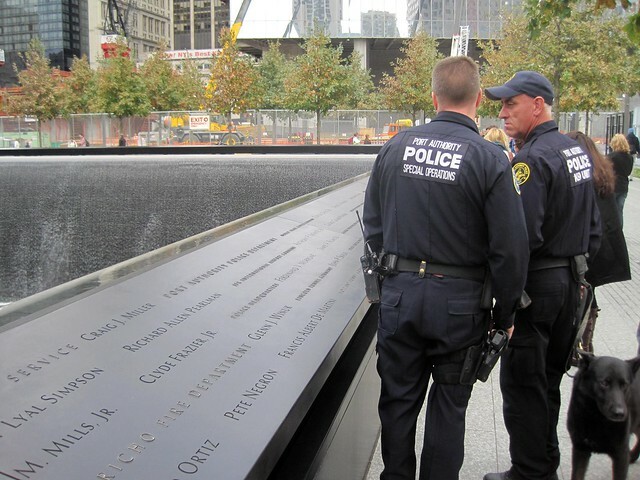 In addition to a timeline and film about the World Trade Center, the center has items available for purchase, with 100% of the proceeds going to the 9/11 Memorial Fund. Lastly, if you have time, walk through the World Financial Center. The floor to ceiling windows offer a great overview of the entire site and best show the progress that has been made and what is still left to do. – There are no public bathrooms anywhere near the site – not in the memorial, not in the visitor center, not in the Marriott hotel just south of the memorial, not in a Starbucks, nowhere. Plan in advance! – It will be crowded, especially when you’re standing in line at popular times. It’s a bit chaotic with so many people, but well organized at the same time. Bring your patience. – Make sure you’re on time and that each person has their own ticket on its own piece of paper. We saw numerous people turned away because they showed up two hours after their ticket time and we had trouble because our tickets were printed on the front and back of the same sheet of paper. – As I mentioned before, dress for the weather and be prepared to do a lot of walking. – Most importantly, remember where you are. Remember that people’s mothers and fathers, sons and daughters, spouses and friends were lost at this site. Treat it like you would a cemetery. The majority of visitors we saw were quiet and respectful. Great information on the site! It’s simple yet moving. Really appreciate all the details on the process of getting through. This is really helpful. Once the Visitor Center is open, this will make this place that much more emotional. Only days from my visit to the 9/11 memorial, this information is of great help!